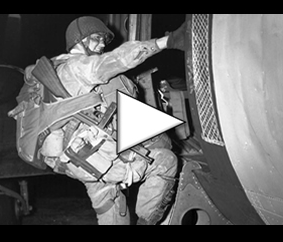 This page presents 308 events that marked D-Day to relive operation Overlord hour by hour, minute by minute (an event every 5 minutes for 24 hours). 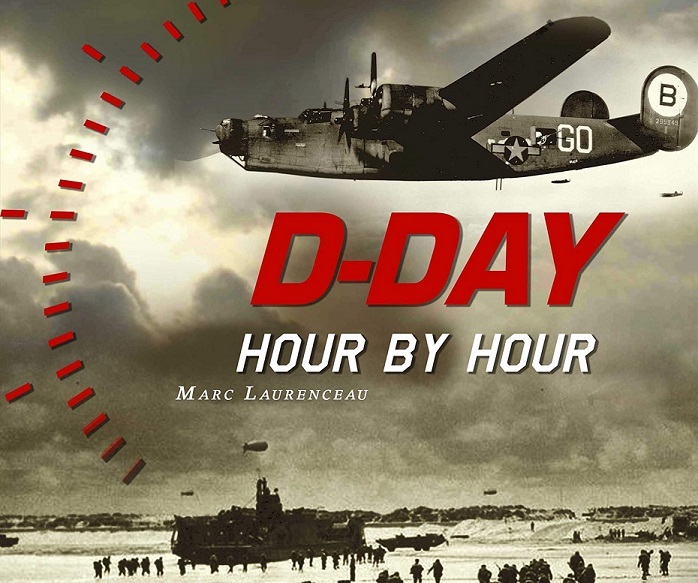 Find this enriched, illustrated and detailed chronology in the book of Marc Laurenceau: D-Day Hour by Hour, the decisive 24 hours of Operation Overlord. 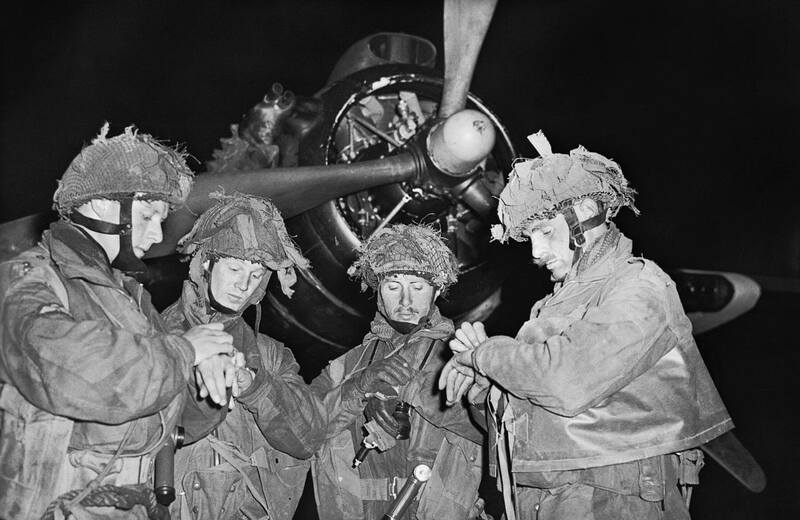 Lieutenants Bobby de la Tour, Don Wells, John Vischer & Bob Midwood of the 22nd Independent Parachute Company, set their watch on June 5, 1944 at RAF Harwell Base. Airborne operations. The mission of the Allied bombing and paratroopers was to disrupt the German forces by destroying communication routes and capturing strategic points. – German sentries spot low-flying aircraft north of Carentan in the Cotentin Peninsula. – The first US pathfinders jump on the Cotentin to mark the parachute zones for the C-47 pilots who will arrive in the next few minutes. – The German paratroopers of the 13th company of the Fallschirmjäger-Regiment 6 report the presence of enemy paratroopers. – The first of the 3 British gliders lands less than 50 meters from the bridge of Bénouville, the Pegasus Bridge. – Merville’s German battery is attacked by 5 Avro Lancasters bombers of the 7th Squadron of the Royal Air Force. – The second of the 3 British gliders lands near the bridge of the Pegasus Bridge. – The last of the 3 Horsa gliders lands near the Pegasus bridge. – Six Albemarle aircraft drop 60 pathfinders from the 22nd Independent Parachute Company on Drop Zones N, V ​​and K east of Orne. – Major Howard and his men storm the Pegasus bridge. – Oberleutnant Brandenburger commanding the 5th Battalion of the 125th Mechanized Infantry Regiment reports to the Regimental Command Post that he is observing an airborne operation to the east of the Orne river. – 110 bombers belonging to the Bomber Command N°1 Group and N °100 Group attack the anti-aircraft batteries in the Caen-Carpiquet area. – 2 Horsa gliders land near the Ranville bridge (Horsa Bridge). The 3rd glider planned for the operation is missing. – Corporal Emile Bouetard, a member of the 4th French Paratroopers Battalion, is shot dead at the Moulin de Plumelec in Brittany. – German reports, sent by the 3rd Battalion of the 919th Grenadier Regiment commanded by Lieutenant-Colonel Hoffmann, indicate the presence of enemy paratroopers. – The 5th Brigade of the 6th British Airborne Division commanded by General Nigel Poett is dropped near Ranville. – The radars of the German Navy (Kriegsmarine in German) signal an important armada in front of the Pas-de-Calais. – German Sergeant Ludwig Förster discovers the allied armada off its Wn 62 strong point (Omaha Beach for the Allies). – 36 French paratroopers, gathered in 4 teams, jump over Brittany, in the forest of Duault and near Plumelec. – All German troops to the orders of the 84th German corps, from the Orne river to Saint-Malo, are on alert. – The 716th German Infantry Division warns General Marcks of the 84th Army Corps in Saint-Lô of the presence of enemy airborne units in the Cotentin. – The pathfinders of the 82nd Airborne Division jump over Normandy above the Cotentin to attempt to mark 3 landing zones for the rest of the division (Drop Zones N, O and T). – General Dollman orders the general alert of the VIIth German Army. – The sirens of the Pointe du Hoc battery are activated to signal the appearance of allied bombers. – General Marcks of the 84th Army Corps receives new information concerning the enemy paratroopers, spotted between Sainte-Marie-du-Mont and Sainte-Mère-Eglise. – In Paris, near the Bois de Boulogne, Naval West Group chief of operations, Admiral Karl Hoffman, summons the various staffs following the accumulation of alarming reports. He sends the following message to Germany: “Report to the headquarters of the Führer that it is the invasion”. – Take-off in England of the bombers of the 8th US Air Force. 1,198 aircraft are deployed in total. – Marshal von Rundstedt is made aware of alerts following the discovery of paratroopers, notably reported by the 352nd Division. – Captain Wagemann (Duty Officer) places the 21st German Armored Division on level 2 alert (movement ability in less than an hour and a half). – The 1. Panzerjaeger Kompanie of the 716th Infantry Regiment leaves Biéville to patrol along the Orne canal in the direction of the Bénouville and Ranville bridges. – The 352nd German Infantry Division reports the end of alert for all of its units. – The Force U ships arrive off Utah Beach and droppe anchor 24 kilometers from the shore. – Serious fighting is taking place in the locality of Ranville between the British airborne troops of the 6th Airborne and the German soldiers of the 716th Infantry and the 21st Panzer Division. – An armored vehicle from the 1. Panzerjaeger-Kompanie of the 716th German infantry division is destroyed on the Caen-Ouistreham crossroads in Bénouville by a PIAT of the 7th battalion (6th Airborne Division). – Fixed transmitters “Bag Pipe” and “Chatter” from England come into action and blur the communications of the Kriegsmarine and Luftwaffe (German Air Force). – Two planes towing gliders are spotted by the Feldpostamt of the 352nd Infantry Division. – Marshal von Rundstedt reports by radio to the VIIth German Army that he does not believe in a large-scale landing. – The 914th Grenadier Regiment (352nd Infantry Division) reports that 50 to 60 paratroopers jumped south of the Grand Canal of Carentan. – Force O ships arrive off Omaha Beach and drop anchor 23 kilometers from shore. – The S-Boote of the German Kriegsmarine set out on a hunt in the Channel, following the landing of allied paratroopers. But the first patrol encounters no target. – US soldiers from O-Force off the coast of Omaha Beach begin to embark in the landing craft. – US soldiers from the U Force off Utah Beach begin to embark in the landing craft. – Sergeant Ludwig Förster fires three white rockets from his Wn 62 strongpoint near Colleville-sur-Mer (Omaha Beach) to ask offshore ships to identify themselves. The other points of resistance of the area do the same. No response from ships. – The Royal Air Force bombards targets on Caen. – The 914th Grenadier Regiment (352nd Infantry Division) reports that “new groups of paratroopers have been spotted south of Brevands“. Other parachuted units are located near Cardonville. – Lieutenant Braatz of the 21st Panzer Division is heading for Bénouville and the Pegasus Bridge to counter-attack. – The 8./(Schwere) Pz.Gren.- Kompanie 192 is sent to reinforce in the area of ​​Bénouville. – The 84th German Corps is informed that all areas are calm except south of Brévands where the equivalent of a battalion has been parachuted, and near Cardonville where isolated units are spotted. – The commander of the coastal troops is informed that unknown naval units have been located 11 km off Grandcamp. – General Gale, commander of the 6th Airborne Division, is parachuted with his staff above the “N” jump zone near Ranville, as part of Operation Tonga. – Lieutenant-Colonel Terence Otway, who was able to gather only 170 British paratroopers out of the 635 planned, is preparing to move towards the Merville battery. – The troops and vehicles of the 21st Panzer Division are ready to be deployed. – 55 Horsa gliders containing forces destined for the 6th British Airborne Division land as part of Operation Tonga in the Ranville area. – Parachutists are reported in Amfreville, Herouvillette and Gonneville. – 52 American Waco gliders containing forces destined for the 101st Airborne Division land as part of Operation Detroit north of Hiesville. – The 914th regiment of grenadiers of the 352nd Infantry Division reports that two parachutists in camouflage uniform are prisoners near Cardonville while about 70 paratroopers would have jumped near Isigny-sur-Mer. – Liberation of Sainte-Mère-Eglise by American soldiers of the 3rd battalion of the 505th Parachutist infantry regiment. The American flag is hoisted at the town hall. – 52 American Waco gliders land as part of Operation Detroit northwest of Sainte-Mère-Eglise. – Marshal von Rundstedt asks the Supreme Command at Berlin for permission to deploy two divisions to the coast. – Violent aerial attack by the Allies of German strongpoints Wn 44, 47 and 48. – Hitler lies down at his home in Berlin after waking late, listening to Wagner. – Death of General Pratt, second in command of the 101st Airborne Division, in the brutal landing of his glider (called “Fighting Falcon”) near Hiesville. – Panzergruppe West is alerted to level 2 (intervention time of one and a half hours maximum). – The staff of the 352nd Division gives the order of movement to Lieutenant Meyer of the 915th Grenadier Regiment, to be deployed in the direction of Montmartin-Deville, by the bridge to the west of Neuilly. – Four American scouts belonging to the 2nd and 4th squadrons of Cavalerie land on the island of Large, facing Saint-Marcouf. – The staff of the 352nd Infantry Division gives the order of attack to the 914th regiment of grenadiers against the paratroopers troops south of Carentan. – 132 American soldiers belonging to the 2nd and 4th Cavalery squadrons, led by Lieutenant-Colonel Dunn, land on the (mined) beaches of the Saint-Marcouf Islands. – Lieutenant-Colonel Otway launches his 9th battalion (3rd Brigade, 6th Airborne Division) in the assault of Merville’s battery. – Soldiers on ships bound for Anglo-Canadian beaches who have managed to find sleep are awakened. – The 916th German Grenadier Regiment captures an American officer who confirms the existence of parachutist mannequins equipped with explosives. – Aerial bombardments on Le Guay, Pointe du Hoc, Grandcamp and Maisy. – The Korvettenkapitän Heinrich Hoffmann, commander of the 5th flotilla of speedboats located in Le Havre, is ordered by the Marinegruppen-Kommando West to patrol in the Bay of Seine. – Pocket submarines (X20 and X23) in charge of marking the route of the Allied Armada arrive nearly a kilometer from the Norman shore. – Lieutenant-Colonel Terence Otway shoots a yellow rocket towards the sky, spotted offshore by the cruiser Arethusa, sign that he is now in control of the German battery of Merville. 70 officers, non-commissioned officers and soldiers of the English rank were killed during the assault. – The 352nd Infantry Division reports to the 84th Corps that it is no longer able to locate the ships. – Several four-engineers towing gliders over Houlgate and Cabourg are reported by German units, as well as airborne operations in Morsalines, Saint-Côme-du-Mont and Sainte-Mère-l’Eglise. Three American paratroopers with maps of the mouth of the Vire have been captured. – The 716th German infantry division reports that the number of gliders in the area of ​​the mouth of the Orne is constantly increasing. The landing. Allied ships and bombers bombard the coastal defenses, and the landing of the Allied amphibious force begins. – First shots of naval artillery on the German coastal positions by the HMS Orion cruiser off Gold Beach, then by the Ajax, Argonaut, Emerald cruisers, by the Dutch gunboat Flores and 13 destroyers. – Attack of the Mont Canisy German battery oby 18 Marauder bombers of the U.S.A. Air Force. – Free French war-ships Georges Leygues and Montcalm bombard the German battery at Longues-sur-Mer, which opened fire on the American warship USS Arkansas. – Report transmitted by the 352nd Artillery Regiment to the staff of the 352nd German Infantry Division: “Advanced observers of artillery groups 2 and 4 report perception of noises, probably naval units moving towards the Vire estuary and the Guay-Pointe du Hoc, 29 ships, of which 4 are quite large (destroyers or cruisers), are observed at a distance of 6 to 10 km. At Formigny, one (Polish) pilot made prisoner. The number of landing craft in front of Port-en-Bessin is about 50“. – General Edgar Feuchtinger, commander of the 21st Panzer Division, arrives at his command post in Saint-Pierre-sur-Dives. – Three German gunboats fleeing from Ouistreham on the Canal de Caen are intercepted by the men of Major Howard at the Pegasus Bridge: one is destroyed, another is stranded nearby, and the third takes refuge further north in the area of Le Maresquier. – Norwegian destroyer Svenner is sunk off Sword Beach by a German S-Boote (torpedo boat), killing 30 sailors and soldiers. 18 torpedoes were fired by 3 S-Bootes from the 5th Squadron, based at Le Havre. – Soldiers of the first wave of the Force S (Sword Beach) embark in the landing craft. – First allied dive bombing of the day, near Falaise. – Eastern Task Force warships led by Rear-Admiral Phillip Vian open fire on the British and Canadian beaches of Gold, Juno and Sword. – LSI ships intended to land men on Juno Beach drop anchor. – The staff of the German 352nd Infantry Division receives information that no ship is in sight off Carentan. – 29 American amphibious tanks from the 741st Tank Battalion are launched 6 km off Omaha Beach. 27 are intended to sink. – Guns of the German Longues-sur-Mer battery open fire on USS Emmons destroyer and USS Arkansas cruiser. – Bombardment by the naval artillery of Houlgate, Mont Canisy and Villerville batteries. – Battleship USS Texas fires for the first time (on the American sector of Omaha). – USS Arkansas cruiser opens fire again. – 329 British Liberator bombers attack the German coastal installations. – A ship in charge of guiding the landing craft to Utah Beach, P.C. 1261, enters an area polluted by mines and strikes one of them. Other ships sank a few minutes after for the same reason. – Sunrise. The weather is gray, the swell very important, low clouds let out short rains. Wind force is 3 to 4. – 270 American Marauder bombers drop 4,404 bombs of 110 kg each on targets along the Norman coast. – Major von der Heydte commanding the 6th German parachutist regiment begins the interrogation of American paratroopers prisoners in Carentan. – Engineers from the 10th section of the 3 Parachute Squadron Royal Engineers led by Lieutenant Jack D. Inman and parachutists of the 1st Canadian Parachute Battalion blow up the bridge of Robehomme on the Dives river. – The German 352nd Infantry Division reports that a first group of ships, accompanied by four smaller convoys, sets out offshore, and that small ships are gathering together off Grandcamp. – Severe aerial bombardments are reported on the strongpoints located at Arromanches, Sainte-Honorine and Colleville. – German 726th Grenadier Regiment informs its headquarters that a shot down bomber crew was located north of Sully. – The landing craft off Commonwealth landing sectors, located about 7 km from the shore, go towards the beaches. – German 709th Infantry Division reports that Saint-Mère-Eglise is occupied by paratroopers. – German 352nd Infantry Division reports that between 6 and 10 kilometers offshore of Le Guay-Pointe du Hoc, 29 vessels, including 4 large units, are located and off Port-en-Bessin this number rises to 50. – Four allied aircraft are destroyed near Formigny, a Polish pilot is a prisoner. – The German 726th Grenadier Regiment reports that 30 ships are moving at a slow pace at 10 kilometers off Port-en-Bessin. The German battery of Longues is able to destroy them. – Omaha Beach: end of the barrage bombardment on the coast (except for the Satterlee and Talybont warships). – Omaha Beach, Dog Green and Dog White sectors: landing of 32 amphibious tanks (C and B companies of the 743th Cavalry Battalion). – Omaha Beach: air attack by 18 Marauder bombers on Pointe du Hoc, then the USS Texas fires on the German battery. – General Feuchtinger, leader of the 21st German Panzer Division, gives the order to attack the bridgehead of the 6th Airborne British Division beyond the Orne river. – Utah Beach, Uncle Red area: landing of the 2nd Battalion, 8th Regiment, 4th US Infantry Division. – Omaha Beach: landing of the first assault wave of the 116th Regiment, 29th Infantry Division. – Utah Beach: landing of the second assault wave composed of elements of the 8th regiment of the 4th Infantry Division. – The 84th German Army Corps reports that 12 enemy soldiers have been captured while three large warships are approaching the coast, surrounded by numerous landing craft. – Omaha Beach: landing of the second assault wave of the 116th Regimen, 29th Infantry Division. – General Dwight Eisenhower wakes up after a short nap. He receives an optimistic call from Admiral Ramsay that reassures him. 06:42– US Admiral Kirk, commander of the West Naval Training, reports that “everything is going according to plan”. – Fleet support warships in the east open fire on their designated targets. They must stop shooting five minutes before the landing of vehicles and troops. – Utah Beach: landing of the 32 amphibious tanks of the 70th Armored Battalion. 28 reach the shore. – Omaha Beach: landing of the second wave of assault. – Destroyer H.M.S. Wrestler hits a mine in the Eastern Task Force area. – B-25 aircraft of the 8th and 342nd Squadrons of the Royal Air Force (including the French group “Lorraine”) complete the installation of a smoke screen that protects the allied armada. – General Speidel places the 21st German Panzer Division under the orders of the German 7th Army. – The 352nd German Artillery Regiment reports that between 60 and 80 landing craft are approaching off Colleville-sur-Mer. The regiment can not take over all enemy units. Maisy and Marcouf batteries are under fire from the naval artillery. – The 914th German Grenadier Regiment reports that three warships bombard the Maisy sector in particular. – Pointe du Hoc: a white flare is spotted by the allied armada. – Omaha Beach: landing of the second wave of assault is still going on. – The 916th German Grenadier Regiment reports that strongpoints on the beach are under continuous fire from the naval artillery. – Omaha Beach: the 88 mm barrel of the Wn 61 strongpoint is put out of action, its mouth brake having been destroyed by a direct hit, either from Naval artillery or Sergeant Turner Sheppard’s Sherman tank. – Omaha Beach: Colonel Rudder’s 225 Rangers, delayed by erroneous navigations and a strong sea current, land 41 minutes late at Pointe du Hoc. – Pointe du Hoc: Rangers from Task Force C are on their way to Dog Green (Omaha Beach) because they have not received the signal to request reinforcements from Pointe du Hoc. – Omaha Beach: the 726th German Grenadier Regiment reports that the Wn 60 strongpoint is severely bombed and that 20 landing craft, spotted by Wn 37, are approaching. – Gold Beach: landing craft equipped with 127 mm rocket launchers open fire on coastal defenses. – Omaha Beach: The 916th German Grenadier Regiment reports that amphibious tanks have been identified in the area of Vierville-sur-Mer. – End of the naval bombardment on Gold, Juno and Sword. – Sword Beach: landing of the tanks of the 22nd Dragoons transported aboard ten L.C.T. – Gold, Juno and Sword Beach: demining and obstacle clearing special tanks land. – Gold Beach: landing of the 50th British infantry division, led by Major General Graham. – Sword Beach: landing of the Avre tanks of the 5th Assault Regiment R.E. belonging to the 79th Armored Division. – Paratroopers of the 3rd battalion of the 502nd PIR (101st Airborne Division) seize the beach exit N°3 to the west of Utah Beach, near Audouville-la-Hubert. – Omaha Beach: Surviving Rangers from C Company reach the plateau east of exit D-1 (Vierville-sur-Mer). – Sword Beach: landing of the Kieffer (Free France) commando in front of Colleville-sur-Orne (today Colleville-Montgomery). – Omaha Beach. German message sent by the 726th Grenadier Regiment: “the first landing craft reached the coast in front of the Wn 65 and 69 strongpoints with amphibious tanks“. – Omaha Beach: LCI (Landing Craft Infantry) number 91 is hit by a mine and by German artillery, causing the death of 73 soldiers. – Pointe du Hoc: the Rangers set up a temporary headquarters in a crater in front of the L409A antiaircraft bunker (37 mm gun), east of the German battery. – Omaha Beach: German soldiers at the Wn 70 strongpoint announce the breakthrough of six US tanks, three of them at the WN 66 strongpoint. – Omaha Beach: C (Task Force C) consisting of A and B companies of the 2nd Rangers Battalion are about to land on the edge of the Dog Green and Dog White areas. All 5th Rangers Battalion is heading for Dog Green. – Juno Beach: landing of the 3rd Canadian infantry division led by General Keller. – Utah Beach: four battalions have landed. – One of the two 210 mm Skoda K52 guns of Czechoslovak origin of the Crisbecq battery is put out of action by the allied warships shells. – Omaha Beach: US soldiers reach the top of the dune at the Wn 60 strongpoint. – Omaha Beach: landing of the men of the 5th Battalion of Rangers, who were originally to land at Pointe du Hoc. – Sword Beach: landing of an anti-tank section which gradually reduces to silence the different German defensive positions. – Juno Beach: the 3rd Canadian Infantry Division reports the explosion of about sixteen shells per minute on the Mike Green beach area. – The 200th German tank hunter regiment is ordered to move in the region of Martragny, Vendes and Basly. – Report of the 916th German Grenadier Regiment sent to the staff of the 352nd German Infantry Division: “Weak enemy assaulted the Pointe du Hoc battery. The 1st platoon of the 726th Infantry Regiment is engaged in counter-attacking 50 men in front of the Wn 68 strongpoint in Vierville, others in smaller numbers in front of the Wn 62 strongpoint“. – Omaha Beach: The 726th German Grenadier Regiment reports that the Wn 60 strongpoint is under fire and that 40 soldiers accompanied by an amphibious tank have landed in front of this fortified point. – Omaha Beach: all the amphibious tanks destined to land on Fox Green have sunk between their starting point and the beach. – Omaha Beach, Dog White Area: LCI (Landing Craft Infantry) number 91 sinks. – Utah Beach: the Saint-Martin-de-Varreville battery is announced destroyed on the radio by Colonel Cassidy commanding the 1st battalion of the 501st (US) Parachute Infantry Regiment. – Pointe du Hoc: The 916th German Grenadier Regiment reports to the headquarters of the 352nd German infantry division: “Near the Pointe du Hoc, the enemy climbed the cliff (with ladders and ropes thrown by projectiles)“. – Omaha Beach: The 726th German Grenadier Regiment reports that the 88 mm gun of the Wn 61 strongpoint is out of use and that landing craft are spotted in front of Wn 37 and 37a strongpoints (the latter being bombarded by naval artillery). – Gold Beach: landing of the 7th battalion of the Green Howards, 69th Infantry Brigade, 50th (Northumbrian) Infantry Division. – Sword Beach: landing of the whole Commando N°4, 1st Special Service Brigade. – Omaha Beach: the landed troops report that they are under the fire of Maisy’s batteries. – Omaha Beach: the Wn 62 strongpoint is infiltrated by American soldiers while the Wn 61 strongpoint is attacked from front and back. German radio communication to Port-en-Bessin is interrupted. – Gold Beach: landing of the Royal Marines Commando N°47. – Omaha Beach: the landing is temporary stopped due to lack of space on the beach. The Germans believe in victory for a few minutes. – Omaha Beach: counter-attack of the 915th regiment of grenadiers to regain control of Wn 60 trongpoint. – Omaha Beach: General Cota establishes his command post on the beach. – Sword Beach: German pilots Priller and Wodarczyk (JG26) take off from their base in Bondues north of Lille and make a passage over the beach aboard their Focke Wulf 190. They land at the base of Creil (JG2) without troubles. – The men of Sergeant Davies of C Company of the 1st Canadian Parachute Battalion blow up the bridge at Varaville on the Dives river with the help of the sappers of the 3rd Parachute Squadron RE. – Omaha Beach: troop transport LCT 538 reports that it could not land its transport because of the shooting of an 88 mm gun having injured 5 Americans soldiers. – Omaha Beach: the Americans make their first four prisoners, from 8th company of the 916th Regiment (352nd German infantry division). – Omaha Beach: the 352nd Infantry Division reports to the 84th Corps that between 100 and 200 soldiers have penetrated the defense at Colleville and that a battalion (“Meyer” battalion) reinforces the German defensive positions. – Omaha Beach: the 916th Grenadier Regiment reports that the Wn 70 strongpoint fell into the hands of the enemy. 3 tanks passed through the Wn 66 strongpoint and the upper casemate of the Wn 62 is destroyed. – Sword Beach: landingof the Royal Marines Commando N°41. – Omaha Beach: the 1st Battalion of the 116th American Infantry Regiment reports that it is blocked by heavy machine gun fire and calls for support from the naval artillery. – Omaha Beach: the 352nd Artillery Regiment struggles to maintain radio contact with the Wn 60 strongpoint. – Gold Beach: the 726th Grenadier Regiment reports that 30 enemy tanks landed between the Wn 35 and Wn 36 strongpoints. – The second 210 mm gun of the Crisbecq battery is put out of action by Allied ships. – Pointe du Hoc: the Rangers repulse a counter-attack led by the first company of the 916th German Infantry Regiment. – Omaha Beach: the Wn 60 strongpoint (Fox Red area) protecting the F1 exit is silenced by the men of the 1st US Infantry Division. – Sword Beach: the survivors of the Kieffer commando storm the casino bunker in Ouistreham. – The German speedboats of the 5th Squadron are back at their base of Le Havre. – Hitler wakes up at his home in Berlin after having been up late the night before, listening to Wagner’s music. – Canadian soldiers land on the beach area coded Mike Red (Juno Beach). They report that the situation is excellent. – Omaha Beach: the Rangers landed on the beach report that the tide is rising rapidly and that beach obstacles have still not been demolished. They are requesting support from demolition teams. – The 352nd German Infantry Division reports the loss of strongpoints Wn 65, Wn 68 and Wn 70. – The men of Lieutenant Shave of the third section of the 3rd Parachute Squadron RE blow up the railway bridge of Bures on the Dives river. – Two companies of the 21st Panzer Division (7/192 and 8 (schw. )/192) are ordered to set up defensive positions between Périers-sur-le-Dan and Saint-Aubin-Arquenay. – The ships off Omaha Beach are organizing a new naval artillery barrage on the German defenses, ordered by General Huebner, at the risk of killing American soldiers. It lasts twenty-eight minutes. – The German battery of Longues-sur-Mer ceases momentarily to shoot towards the sea. – The 716th German Infantry Division reports that about 30 enemy tanks are moving south towards Meuvaines. – Gold Beach: the 352nd German Artillery Regiment reports that about 6 amphibious tanks were destroyed by mortar fire in front of strongpoint Wn 35. Sword Beach: in Ouistreham, the amphibious support tank requested by Commandant Kieffer (belonging to the 13th/18th Hussars) arrives in front of the casino bunker and opens fire, allowing the French commandos of the 1er Bataillon de Fusiliers Marins Commandos to storm the position. – Omaha Beach: General Omar Bradley receives a loss estimate stating that 3,000 soldiers are out of fight, while soldiers of the 16th Regiment of the 1st American Infantry Division are on the way to Port-en-Bessin. – Gold Beach: the 352nd German Artillery Regiment reports that the Wn 35 and 36 strongpoints are destroyed while the guns of Wn 40 destroyed 4 tanks and 3 landing craft. – Gold Beach: a dozen Focke Wulf 190 German fighters attack the beach. – Juno Beach: the locality of Bernières is liberated by the men of the North Shore Regiment and the Queen’s Own Rifle. – Sword Beach: the town of Hermanville is liberated by the South Lancashire Regiment while the 1st Suffolk lands. – End of the second artillery barrage on Omaha Beach. – A reconnaissance patrol of the Royal Air Force reports the presence of armored vehicles north of Caen. – The 352nd German Infantry Division reports that all radio contacts with the 916th Grenadier Regiment are broke down. – Omaha Beach: two US destroyers are approaching within 1 km of the shoreline to support isolated groups trying to get out of the beach. – Omaha Beach: about 200 soldiers of the 1st Battalion of the 116th Regiment (29th US Infantry Division) climbed the cliff and reach Vierville-sur-Mer. – Omaha Beach: the Wn 64 strongpoint is silenced by the American troops. – Sword Beach: the British soldiers of Commando No.4 reach the port of Ouistreham where the German defense is concentrated. – General Marcks decides to counter-attack with the 21st Panzer Division. – General Edgar Feuchtinger is ordered to counter-attack with his tanks along the river Orne against the British paratroopers of the 6th Airborne Division. – Omaha Beach: the command post of the 726th German Grenadier Regiment (716. Infantry Division) receives the following message from the Wn 62 strongpoint: “Wn 60 still holds, Wn 62 is still in action with a machine gun, but the situation is critical – elements of the 1st and 4th companies counterattack“. – The 914th German Grenadier Regiment reports that many enemy ships have entered the Carentan Canal but have not yet commenced landing operations. – Omaha Beach: at the Wn 62 strongpoint near Colleville-sur-Mer, the two 76.5 mm guns are destroyed at the same time by naval artillery. – Omaha Beach: the 916th German Grenadier Regiment reports that between 60 and 70 landing craft are disembarking soldiers in front of the Wn 65 strongpoint in Saint-Laurent-sur-Mer. The German troops of Pointe du Hoc no longer answer radio calls. – Omaha Beach: three tanks are reported by the 916th Grenadier Regiment west of Wn 38 strongpoint. – West of Utah Beach, American paratroopers of the Dog Company (505th PIR) are involved in heavy fighting near the town of Neuville-au-Plain. – Omaha Beach: the two 75 mm guns of Pointe de la Percée, the cause of many destructions, are put out of action by destroyer USS McCook. – Omaha Beach: the Wn 65 strongpoint at the junction between the Easy Green and Easy Red beach sectors and protecting the E1 exit is stormed by American soldiers. – General Feuchtinger is ordered to move his 21st Panzer Division to the west of the Orne Canal and to engage it north of the Bayeux-Caen line. – The German radar station at Pointe de la Percée is attacked by destroyer USS Thompson off Omaha, which fires 127 mm shells. – Pointe du Hoc: rhe 3rd company of the 726th German Grenadier Regiment reports to the headquarters of the 352nd Infantry Division: “The enemy, with 2 companies, invested the battery of the Pointe Du Hoc. Special shells with ladders were fired on top of the cliff, thus this natural obstacle can be climbed“. – Gold Beach: 7 beach exits have been cleared. – Omaha Beach: the 914th German Infantry Regiment reports that the Wn 60 strongpoint still holds while the Wn 61 has fallen and that the Wn 62 is in a critical situation even if it still has a machine gun. Survivors of the 1st and 4th battalions prepare a counter-offensive to reconquer the Wn 61. – Omaha Beach: elements of the 5th Battalion of Rangers reach the town of Surrain (south of Colleville-sur-Mer). – Omaha Beach: the 916th German Grenadier Regiment reports that the attackers hold the heights of Saint-Laurent-sur-Mer beach. The commander of the 352nd Infantry Division gives once again the order to “counter-attack to push back the enemy at sea“. – Omaha Beach: the 1st battalion of the 18th Infantry Regiment (1st US Infantry Division) has landed. – The 726th German Grenadier Regiment reported that three landing craft were destroyed in the port of Port-en-Bessin. – Utah Beach: 4 beach exit routes (causeways) are controlled by paratroopers of the 101st Airborne Division. – Utah Beach: the 2nd battalion of the 8th RCT enters Poupeville. – Utah Beach: Dog Company of the 501st Parachute Infantry Regiment reaches the village of Angoville. – Pointe du Hoc: the last 6 defenders of the observation post surrender to the American Rangers. – Omaha Beach: due to the lack of ammunition, the Houtteville battery (4,500 meters from the beach, near Colleville-sur-Mer) refuses to execute a gun salvo fire order against the landing craft on approach. The battery only fires with one 105 mm gun after the other. – Churchill delivers his speech in the House of Commons, informing the British deputies of the liberation of Rome and the beginning of the Normandy landings. – Omaha Beach: the Americans reach the Church of Colleville-sur-Mer. – Omaha Beach: the 18th Regiment of the 1st US Infantry Division climbs the cliff and heads towards Colleville-sur-Mer. – Omaha Beach: the 726th German Grenadier Regiment reports that the south exit of Colleville-sur-Mer was reached by the Americans and that many tanks were stopped by anti-tank ditches. – Pointe du Hoc. Colonel Rudder receives the reply to his 12:00 message: “no reinforcements possible, all Rangers have landed in Omaha“. – Omaha Beach: General Bradley learns of the breakthrough of some groups of soldiers at the top of the cliffs. – Omaha Beach: the Wn 72 strongpoint (Vierville-sur-Mer, Dog Green area) is under US control. – Sword Beach: the men of the 1st Suffolk Regiment storm the Morris fortified point located in Colleville-Montgomery (at the time Colleville-sur-Orne). – Sword Beach: the Germans counter-attack to seize the Wn 21 strongpoint (position “Trout”) defended by the British soldiers of the 41st R.M. Commando led by Lieutenant-Colonel Gray. – Aerial bombardment of the city of Caen. – Omaha Beach: General Omar Bradley, on the flagship USS Augusta, receives the following report: “Troops previously stopped on beaches Easy Red, Easy Green, Fox Red, progress on heights behind beaches“. – Omaha Beach: the 726th German Grenadier Regiment reports that the Germans seized Colleville-sur-Mer again. – Omaha Beach: German resistance in front of the Dog Green, Easy Green, Easy Red and White Red sectors has stopped. – Pointe du Hoc: German defenders belonging to the Werfer-Regiment 84 abandoned the battery on its western flank. The consolidation. The last German defenders leave their positions one after the other on Omaha, last lock to hold. Now, it is a question of installing a solid bridgehead in Normandy. – Omaha Beach: destruction by destroyer U.S.S. Harding of the bell tower of the church of Vierville-sur-Mer supposed to house German artillery observers. – The locality of Périers-sur-le-Dan, south of Sword Beach, is liberated by the tanks of Staffordshire Yeomanry after violent fighting. – A lifeboat is launched by U.S.S. Barton to rescue the injured Rangers from Pointe du Hoc (but the German artillery barrage prevented it from reaching the shore). – Juno Beach: General Rodney Keller, commander of the 3rd Canadian Infantry Division, gives a press conference in an orchard near Bernières-sur-Mer. – Omaha Beach: the 352nd German Artillery Regiment reports that the village of Colleville-sur-Mer has fallen once again into the hands of the enemy. – Omaha Beach: two American destroyers approach the shore to support the landed troops. – Omaha Beach: the 916th German Grenadier Regiment counterattacks the American advanced units located between the Wn 62a, Wn 62b and Wn 64 strongpoints. – About 80 French resistance fighters were shot dead at the Caen prison by the Gestapo because they could not be moved (the first are shot from 10:00, the following in the afternoon). – General Marcks asks Colonel von Oppeln-Bronikowski to counter-attack with the 21st Panzer Division: “the fate of Germany and this conflict depends ont the success of your counterattack“. – Omaha Beach: failure of the German counter-attack led by the 916th German Grenadier Regiment in Colleville-sur-Mer. – Omaha Beach: Hein Severloh, the last defender of the Wn 62 strongpoint, abandons his post after firing 12,500 rounds with his K98 rifle and his MG 42 machine gun. – Sword Beach: the British control the port of Ouistreham. – Sword Beach: The men and tanks of the 2nd Battalion East Yorkshire Regiment and the 13/18th Hussars storm the Solestrongpoint (Wn 14). – German counter-attack towards the bridge of La Fière, 3 km from Sainte-Mère-Eglise, defended by American paratroopers of Able Company, 505th PIR of the 82nd Airborne. – Omaha Beach: the first American Sherman tank reaches the road linking the beach to Colleville. It is then destroyed by an anti-tank gun. – Gold Beach: The German Wn 35 strongpoint at Le Hamel is under the control of the 1st Royal Hampshire battalion. – Aerial bombardment of the city of Caen. Bombing of the German battery at Mont-Canisy by 37 Marauder aircraft, which drop 61 tons of bombs on the site. – The Shropshire Regiment liberates the locality of Biéville south of Sword Beach, while its armored support of the Staffordshire tanks reaches Blainville. – Marshal von Rundstedt is authorized to engage his two armored divisions. – 25 German tanks belonging to the 21st Panzerdivision counterattack near Périers-sur-le-Dan. – Omaha Beach: General Clarence Huebner lands on the Easy Red beach area. – Omaha Beach: the bell tower of the Church of Saint-Laurent-sur-Mer, which houses German snipers, is destroyed by American naval artillery. – Omaha Beach: Omaha’s westernmost strongpoint, Wn 73, is stormed by men from the 5th Rangers Battalion and the 116th Regiment (29th Infantry Division). – The 916th German Grenadier Regiment informs the headquarters of the 352nd Infantry Division that the village of Saint-Laurent-sur-Mer has fallen into the hands of the enemy. – The speech of General de Gaulle (“The Supreme Battle is Engaged!…“) is broadcast on the BBC. – German armored counter-attack led by Major von Gottberg in the direction of the town of Biéville aimed at pushing back the Canadian soldiers. – Free France warship Georges-Leygues opens fire on the battery at Longues-sur-Mer, west of Gold Beach (which had just attacked the Allied ships), which plunged the site into silence. – Juno Beach: in Saint-Aubin-sur-Mer, the last German defenders of the coastal installations in the Nan Red sector surrender. – Sword Beach: men of the Second Battalion of the East Yorkshire Regiment storm the Daimler fortified point (coded Wn 12) to Ouistreham. – Omaha Beach: the 915th German Grenadier Regiment reports that it has bypassed the Americans from the rear at the Colleville-sur-Mer Castle and that its wounded can no longer be evacuated. – Pointe du Hoc: General Dietrich Kraiss, commander of the 352nd Infantry Division, reports to the officer in charge of the 916th Grenadier Regiment that “the 1st company of the 914th Grenadier Regiment must counterattack at the Pointe du Hoc to resolve the situation. Detachments from Le Guay’s strongpoint must also attack from the east“. – Omaha Beach: the 26th Infantry Regiment (1st US Infantry Division) begins landing. – Destroyer USS Harding bombards once again the steeple of the church of Vierville-sur-Mer. End of shooting at 18:57. – Omaha Beach: in the locality of Colleville-sur-Mer, violent fighting takes place between the American troops and the German defenders. – Pointe du Hoc: the Germans launch a counter-offensive in the east towards the Rangers positions with elements of Le Guay’s strongpoint. – Destroyer USS Harding is bombarding once again the bell tower of the church of Vierville-sur-Mer for two minutes as well as the area near the church. Shells fall on the castle of Vierville-sur-Mer. – New bombing by destroyer USS Harding of the bell-tower of the church of Vierville-sur-Mer for less than two minutes as well as the area located near the church. – Pointe du Hoc: General Kraiss is informed of the German advance, and “the 9th company of the 726th Grenadiers regiment is surrounded by the enemy by the east and the south“. – Omaha Beach: German artillery barrage on the beach in the Colleville-sur-Mer area, where landing operations are continuing. Some losses within the American troops. – Pointe du Hoc: the 916th German Grenadier Regiment reports “paratroopers dropping near Le Guay“. – 6 German tanks of the Panzer-Grenadier-Regiment 192 led by Captain von Gottberg made a breakthrough to Lion-sur-Mer where they observed the landing operations before falling back. – The First Suffolk Regiment troops attack the Hillman fortified site, defended by men of the 736th Grenadier Regiment, south of Sword Beach. – The French commandos of the 1er Bataillon de Fusiliers Marins reach the locality of Le Hauger. – The German Hillman strongpoint is stormed by the men of the Suffolk Regiment and the tanks of the 13th/18th Hussars after hard fighting. – The last elements of the 6th airborne division land with 256 gliders on the landing zones of Ranville – LZ N – and northwest of Bénouville – LZ W – (operation Mallard). – Beginning of airlanding operations – operation Elmira – in the Hiesville sector, involving 36 Waco CG-4A gliders and 140 Horsa gliders towed by 176 Douglas C-47s belonging to four Troop Carrier Groups (TCG). 32 Horsa gliders from the 434th US Troop Carrier Group land in the Cotentin near Hiesville. – Attack led by 3 companies of the 21st German Panzer Division, commanded by General Feuchtinger, south of Juno Beach: it is a failure. – Pointe du Hoc: 24 Rangers of A company,5th battalion, having landed on Omaha Beach reach the Pointe du Hoc battery. – Marshal Rommel arrives at his command post after a car trip of nearly 800 kilometers. – Omaha Beach: artillery barrage from the southeast and from the Maisy area is reported. – After heavy fighting, liberation of the town of Tailleville, defended by the 736th German Grenadier Regiment. – The men of the 1st Royal Hampshire Battalion liberate the locality of Arromanches. – Pointe du Hoc: a counter-attack by 40 German soldiers belonging to the 1st company of the 914th regiment, 352nd Infantry Division, is launched against the Rangers at the Pointe du Hoc battery. – Omaha Beach: Major Tegtmeyer radioed to Colonel Ficchy that nothing is in place to evacuate the wounded and something has to be done.